Released: November 2009. Genre: Action/Adventure. Play Assassin’s Creed II for a couple of hours and you could be forgiven for thinking little had changed since the release of its flawed but intelligent predecessor. Play for a couple of weeks however, and a catalogue of small but meaningful improvements coupled with a generally more adventurous design ethos, and you’ll be in no doubt that the series really found its feet here. As with the first game, ACII runs with an interesting, dual-strand narrative. The story sees Desmond Miles being sprung from confinement within the sinister, high-tech Abstergo Industries, before going into hiding with a small band of allies. Through a virtual-reality machine known as the Animus, Desmond (and therefore the player) is able to relive the exploits of his ancestors, shed light on centuries-old conspiracies and look to discover what it is Abstergo are so desperate to find. Though something of a scientific leap-of-faith, the ‘genes with memory’ trope offers plenty of gaming potential and narrative intrigue. The modern day bits have perhaps wisely been scaled back (amounting to a tiny fraction of the play time) to offer further emphasis on the main meat of the game, which is what takes place in the Animus. 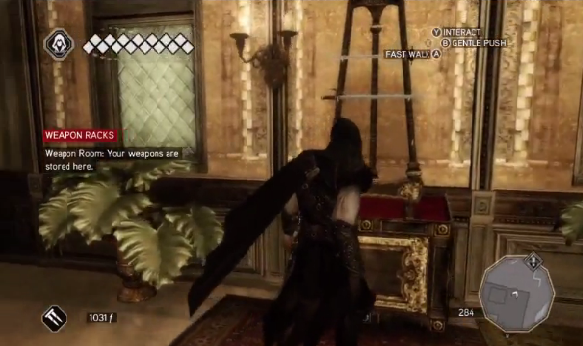 And this time around the destination is 15th Century Renaissance Italy, and the protagonist one Ezio Auditore. 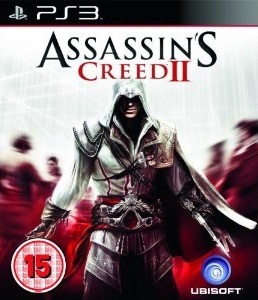 The introduction of a new lead protagonist immediately pays dividends; Altaïr made for a solid hero in the crusades-set original and its portable spin-offs, but at times the story rendered him a little distant. Ubisoft Montreal don’t make the same mistake twice: you’ll follow a sizeable chunk of Ezio’s life, from free-spirited teen to a forty-something assassin, his highs and lows proving as grand as they are empathetic, and that the missions are significantly less mercenary in their nature is a big plus too. ACII mixes open-world adventuring with elements of free-running, not dissimilar to the likes of inFamous or Prototype, only in this instance, there’s the need to be a little more discreet. It’s accomplished stuff, with several tweaks enhancing an already-promising setup. The cities give rise to very active communities; streets bustle with market-holders, carnival performers, musicians, monks and courtesans and there’s even the odd thief who’ll swipe your cash. Braving the rooftops is usually the quickest method of getting about, but attracts the attention of archers so it pays to be fleet of foot. Remaining ‘Incognito’ ensures the city guard won’t bat an eyelid, but become labelled as ‘Notorious’, and they’ll be quick to ready their swords. Tearing down wanted posters and bribing heralds are two ways of reducing visibility, and because it isn’t too fiddly or obtrusive, the whole idea complements the adventuring rather nicely. Combat is better too. Part one was weighed-down by frequent onslaughts that lacked finesse, in part due to a one-button attack system that resulted in some protracted and tedious skirmishes. Whilst still relatively simplistic, the swordfights in ACII are less repetitive and place greater emphasis on blocks, counterattacks and the utilising of various cool pieces of kit Ezio attains. Consequently, there’s a lot more freedom; you can sneak up behind a guard and nick him with a poisoned blade, retreat out of sight, and watch as his frenzied last moments act as a perfect misdirection for the other guards. Meanwhile, there are less lethal ways of diverting attention from high security areas, such as hiring courtesans, who can be instructed to distract specific targets. Smoke bombs are great too for aiding an escape, whilst irritatingly persistent troubadours can be shaken off by throwing money on the ground. Almost without exception, these tools are great, as their effects are usually extremely satisfying thanks to the smart and receptive A.I. Assassin’s Creeed II is in all senses, a beautiful game. Taking example from its predecessor’s clean, bright visuals, the intricate detailing of Florence and Venice in particular offer a dazzling fusion of complex, ambitious architecture and high-end visual clarity. It’s a thrill to climb hundreds of feet up a tower so as to admire the stunning panoramic vistas of the city below, even if they are sometimes accompanied by a thin layer of fogging. 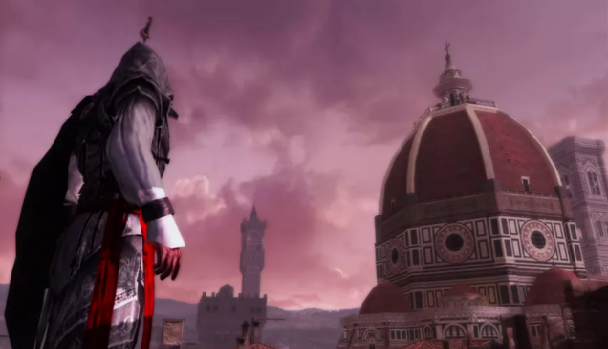 Ezio looks very slick and the general populous of Italy aren’t half bad either. The presentation as a whole is supreme, with the white-washed menus in particular glowing from your TV, the type of thing that HD was made for. 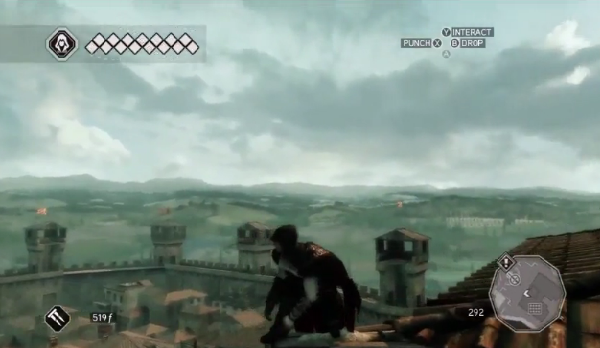 Ezio’s home in Monteriggioni forms a light business element whereby the player invests in the small city, with the pay-off being cheaper prices and a better selection of weaponry and items in stores. It’s a simple but rewarding idea; you’re granted a quantity of florins every twenty minutes proportional to the value of the area. Often overlooked is the game’s excellent use of cross-connectivity with PSP spin-off Assassin’s Creed: Bloodlines. For every boss you’ve slain in the portable version, you’ll be rewarded with their unique weapon in the PS3 game; a commendable bonus for those who’ve tackled both adventures. 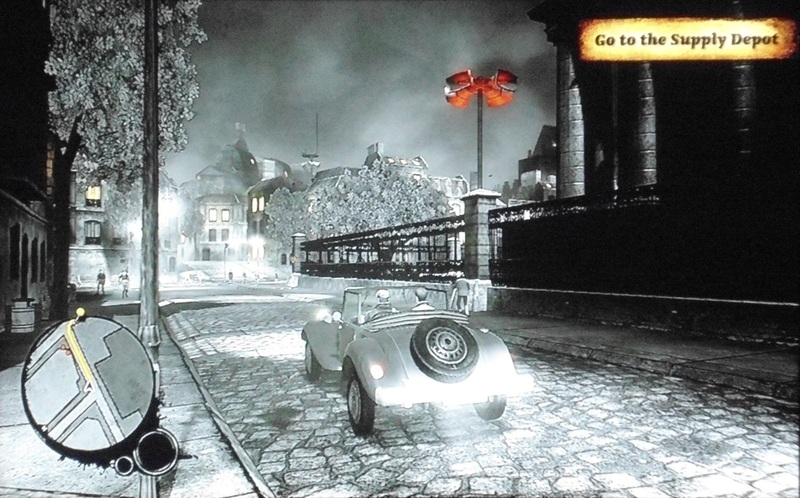 The side-missions, which include beating up unfaithful husbands, racing around the rooftops and carrying out courier and assassination contracts are very enjoyable in the main, though as they have little bearing on an ultimate completion target, they do become marginalised in the latter stages. But there’s plenty more besides, with the Assassin’s Tombs proving a major highlight. Typically set in sprawling cathedrals or catacombs, they reveal the full extent of the game’s artistic endeavours and platforming potential, mixing elegant architecture with stomach-churning heights that frequently see you winding around a building and up into its rafters. The tension when jumping on thin, rickety beams is palpable; you’ll hold your breath all the way. Though this kind of concerted, labyrinthine platforming setup is not as apparent in the freedom of the outdoors, it’s absolutely brilliant in the tombs, rivalling any of the modern Prince of Persia’s for platforming nous. 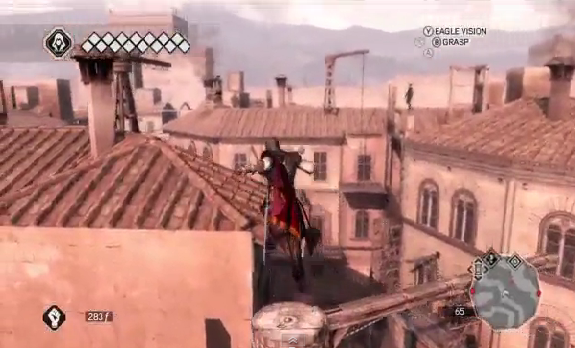 There’s inevitably still the odd peril caused by the controls, with Ezio occasionally lunging to his death from a rooftop having leapt in an entirely unintended direction. It’s important to stress though that this is relatively rare; the vast majority of the time the controls are very sturdy both on the deck and whilst climbing. Some of the cities are undesirably broken up by bodies of water, as whilst locales such as Venice are a pleasure to explore, they’ll frustrate at times as you’ll have Ezio hopping unceremoniously into the canals if you don’t plan routes carefully. At times enthralling and never less than engaging, ACII produces some memorable interpretations of colourful figures from history, most notably the infamous Rodrigo Borgia and the enigmatic Leonardo Da Vinci, who at one stages lets Ezio test his prototype flying machine. Now the dust has settled, it’s clear ACII has the look and feel of something very grand about it. It certainly doesn’t lack for ambition, establishing a strong new story arc that will have you glued to it until the very end, with the promise of much more to come. It really does offer an awful lot of gameplay; especially the Game of the Year edition, as with two excellent expansion chapters and a host of additional quests, the game seems positively epic. Accomplished, addictive and a big step forward from the first game, it’s everything you could have wished to see from such a sequel.